It’s a serious mistake to read too much into what happens in the NFL Preseason - especially in the first game. Starters don’t play much, and there is a lot of rust, so there are ample opportunities for a player to shine in the first game far more than he might once the games actually matter. That being said, the first game can give us a glimpse of players who are ready to do more than people are expecting of them. Seneca Wallace, QB, Cleveland - Jake Delhomme had a pretty good outing for Cleveland, and there is no reason to doubt his position as the starter. Wallace, in his first year in Cleveland after playing for Seattle since he was drafted in 2003, showed that he is more than capable of picking up the slack if Delhomme plays like he did last year, though. Wallace only completed four of eight passes, but two of them were very nice TD throws. Wallace was already entrenched as the second stringer, but his position is now even more secure. Wallace is going to be given every opportunity to succeed, too - new Cleveland boss man Mike Holmgren was eager to trade for him after working with him in Seattle. 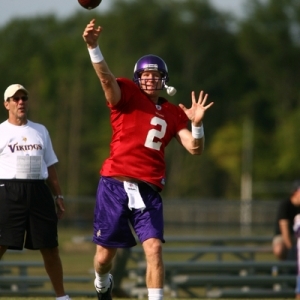 Sage Rosenfels, QB, Minnesota - It seems to be widely felt that Tarvaris Jackson will be the starter in Minnesota if Brett Favre doesn’t come back. Given the uncertainty of that situation, though, it was definitely a surprise to see Jackson play so little - he was in for just one lackluster series. Equally as surprising was how much of an opportunity Rosenfels was given, and how well he played. Rosenfels threw 34 passes - something that almost never happens in the first game of the preseason - and he made the most of it. He completed 23 passes for 310 yards and three touchdowns. It was a sign that Rosenfels doesn’t intend to concede the race to be starter, and perhaps that the Vikings haven’t given up on him, either. Charlie Whitehurst, QB, Seattle - Whitehurst became a bit of a punchline in the offseason when Pete Carroll traded for him soon after taking over the Seahawks and then overpaid him on a new contract. There are still plenty of reasons to be skeptical of that decision, but it looks a little better after Whitehurst’s performance in his first game as a Seahawk. He passed for 214 yards and two touchdowns on 22 attempts for a healthy average of 9.7 yards per attempt. More significant than how he looked against Tennessee’s backups was the confidence and swagger that he brought to the field. A lot of people may not feel like he belongs, but Whitehurst clearly believes that he does. St. Louis’ offensive line - We knew coming into the season that the Rams’ o-line, like pretty much everything else about the team, was a work in progress this year. It was still surprising just how bad the team’s protection was. Last year’s second overall pick Jason Smith was essentially a turnstile at left tackle. In one series he was beaten three plays in a row - with two ending up as sacks of the prized young QB behind him. He was terrible, but he wasn’t alone in putting forth a poor performance. St. Louis QBs were sacked six times and hit eight more. Nothing good is going to happen with this team if the line doesn’t look at least somewhat like a pro line. They barely looked like an average college unit in that game. C.J. Spiller, RB, Buffalo - If you watched Spiller play at Clemson last year then you knew that he had some serious skills. There have been more than a few questions about how he will perform at the next level, though, and a widely held belief that he was taken too early by a team with too many problems. Spiller answered some of his critics with his performance in the first game, though. He didn’t put up big moves, but he showed his explosiveness and electric potential on two plays. That combined with a very strong camp so far has really started to convert critics into believers. Buffalo needs Spiller to come through big time - injuries to Fred Jackson and Marshawn Lynch in the first game suddenly have Spiller at least temporarily atop the depth chart in the backfield.